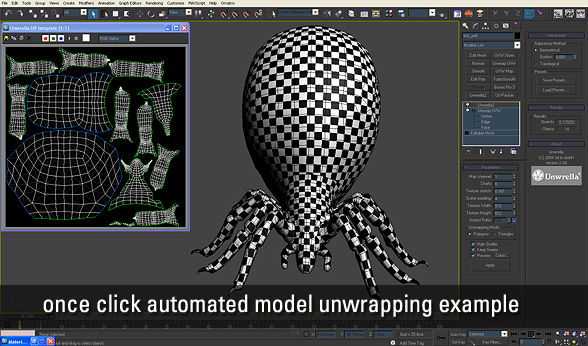 Unwrella is a fast and effective UV unwrapper and UV packer for Autodesk 3ds Max and Maya for Windows. It is designed to easily deal with large numbers of objects that need to be unwrapped. 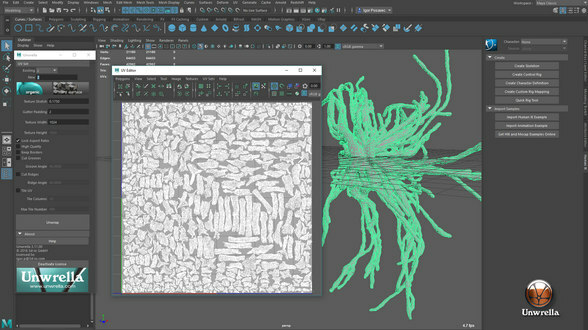 With a single mouse click artists can now unfold objects and produce UV Maps with great UV space utilization. The resulting maps are optimized for texture baking, featuring a uniform distribution of pixels over the object’s surface and reduce the visibility of texture seams to a minimum. Unwrella was developed for the high demands of graphics designers in real world production environments and provides a fast, simple and reliable unwrapping solution. 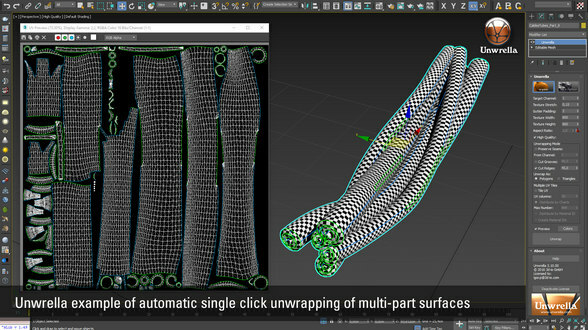 It is the first tool of this kind on the market, allowing the unwrapping of 3d models to be done with a single mouse click while simultaneously providing optimal results that combine the minimized texture stretching of automated unwrapping techniques with the efficient space utilization and chunk distribution of UV space that is achieved with manual pelt wrapping methods. 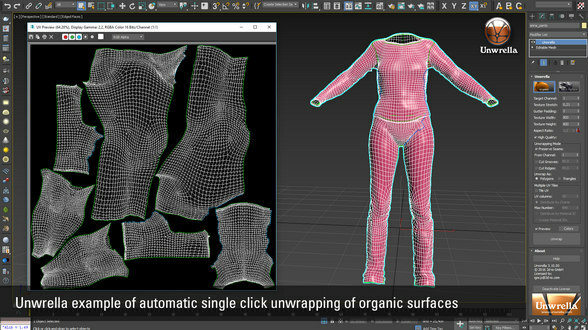 This allows users to quickly solve complex tasks like the creation of seamless 3d models, more accurate lightmaps and productive subsequent processing of the UV maps in other 3d applications like ZBrush™ or Mudbox™. Time efficiency! Time is money,and we all know how long it takes to properly unwrap dozens or sometimes even hundreds of objects in a scene. 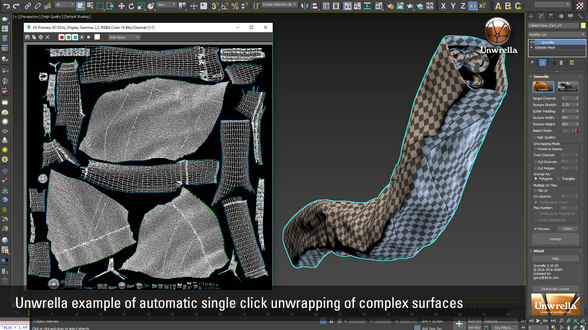 Now imagine that you can select all of them, press “Apply Unwrella” and they get automatically unwrapped with optimally calculated UV maps, ready for your production. Since the parametrization is entirely automatic, the time usually spent by artists manually unwrapping an object is drastically reduced. It is also usually far more accurate than manual unwrapping. A generated stretch of 0 means that every texel covers exactly the same amount of space on the 3D surface. Optimizes map space! You don’t need to bother about the arrangement of the unwrapped chunks: Unwrella does this automatically. Unwrella distributes them in realtime to ensure optimal utilization of the available UV surface. 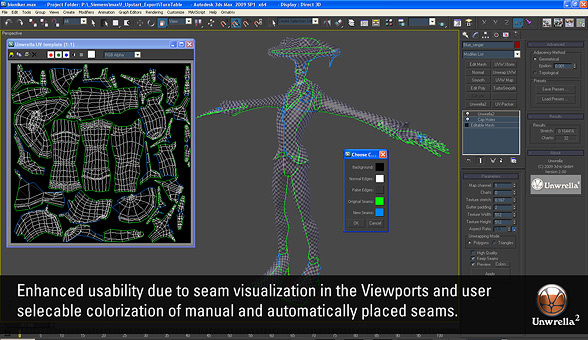 Minimizes visible seams! You are tired of fighting with the seams in your textures and normal maps to prevent them from decimating the visual quality in realtime 3D engines. 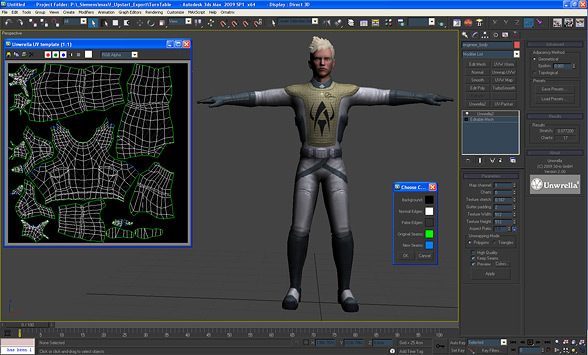 Those seams occur mostly because the classic way of manual unwrapping and pelting can not generate accurate pixel mappings on the chunk borders (their sizes and orientations usually differ) and the resulting mismatch creates visible seams on the connection edges. 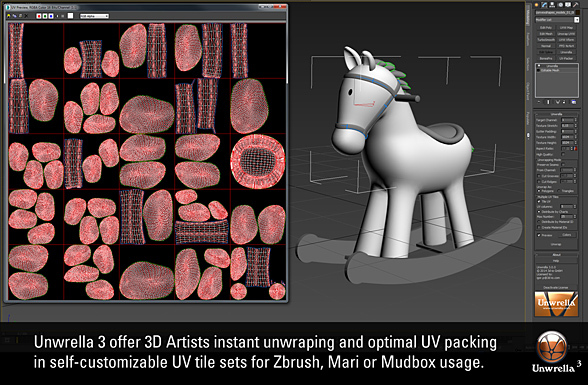 Unwrella 3 offer 3D Artists instant unwraping and optimal UV packing in self-customizable UV tile sets. 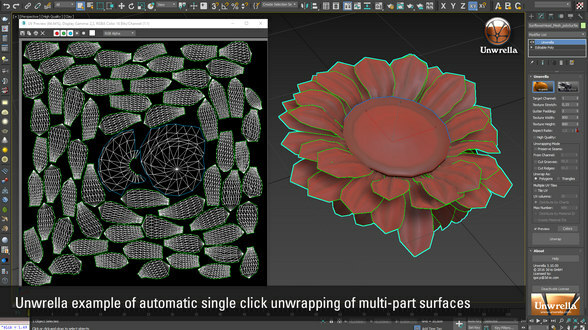 Artists can now easily control the number of UV tiles, automatically generate material IDs for each UV tile or unwrap the UV tiles according to material ID settings. Unwrella offers full support for manually placed seams and can maintain the manually chosen chart distribution during the unwrap process. Enhanced usability due to seam visualization in the Viewports and user selecable colorization of manual and automatically placed seams. 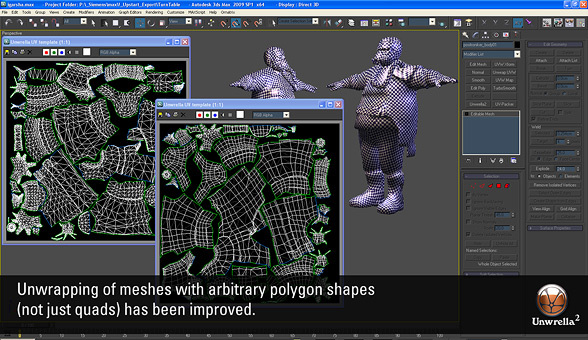 Unwrapping of meshes with arbitrary polygon shapes (not just quads) has been improved. 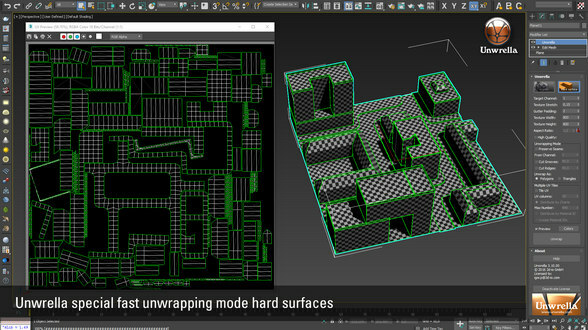 – Unwrella 3 is available now for Autodesk 3ds Max and Maya 2010 or above. The update is free for all registered Unwrella 2 users, a new licence costs € 149,-.